Courtesy of Tattoo Archive: According to tradition, Saint George was a Christian martyr who lived about 275-303 A.D. His father was from Cappadocia, and was a soldier. St. George followed in his father’s footsteps, joined the army and quickly rose through the ranks to be- come a tribune and later a count. He became a member of Roman Emperor Diocletian’s (244-311A.D.) personal guard. The exact date of his birth is debatable, but the Catholic Encyclopedia leaves very little doubt about the historical existence of Saint George, although not much faith can be put in the fanciful tales that are told about him. This Saint is considered one of the most prominent of the military saints and his memorial is celebrated on April 23 (the date of his death) in many places around the world... In addition to being the Patron Saint of England, Saint George is also Patron Saint of Catalonia, Ethiopia, Portugal, Russia and Greece to name just a few, and Patron Saint of a wide range of professions, organizations and disease sufferers. In Bulgaria, Saint George is praised as “liberator of captive, defender of the poor and physician of the sick.” One of the more interesting facts about Saint George is that he is the Patron Saint of the Boy Scouts! Generally when depicted in art, Saint George is clothed in a suit of armor bearing a lance tipped by a cross and riding a white horse. At times his cross can be seen on his shield or armor. The cross is a white flag with a red cross on it. 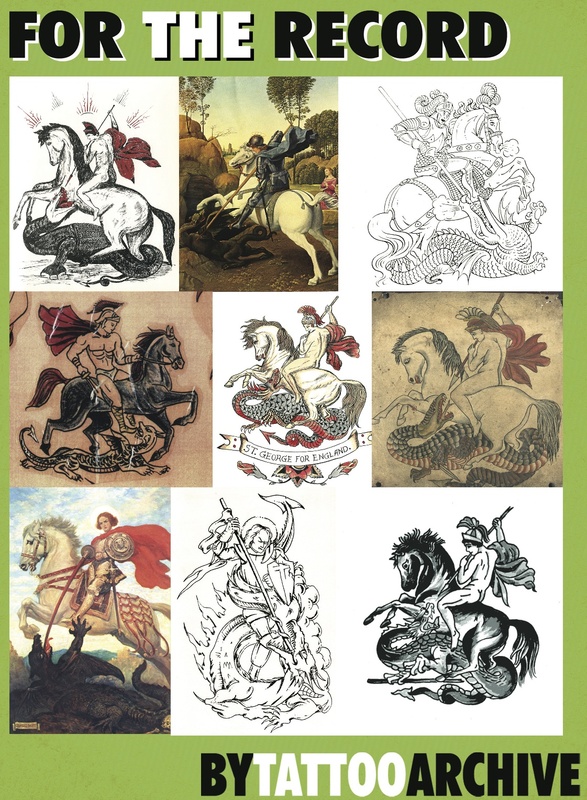 In the tattoo world, the design of Saint George slaying the dragon is popular, but the saint is often naked. The earliest know depictions of Saint George slaying the dragon are from 11th century Cappadocia. The popular legend goes that a plague-bearing dragon lived in a local lake near Silene in Libya. To appease the beast, locals fed the dragon sheep and maidens. The maidens would draw lots to see who would be sacrificed to the dragon. As fate would have it one day the lot fell upon the kings daughter. The king was grief-stricken and offered the people all of his gold and silver if his daughter could be spared but they refused. She was marched off to the lake dressed as a bride to be fed to the dragon. Saint George, hearing of this rode to the lake and in time the dragon reared up out of the lake. After making the Sign of the Cross, Saint George attacked on horseback and wounded the dragon with his lance. Saint George then called for the princess to throw him her girdle which he put around the dragons neck. Once he did this, the dragon followed the princess around like a pet. The dragon was led back to town and Saint George promised to slay the dragon on the spot if the people of the town consented to become Christians and be baptized. The king and his people converted to Christianity, Saint George slayed the dragon, and everyone lived happily ever after. Tattoo Archive © 2009 This installment of For the Record was in Tattoo Artist Magazine issue #20.